It has been suggested that physical activity in breast cancer patients can not only improve quality of life. Influences on physical and psychological levels have been evaluated, but effects on the immune system of breast cancer patients are hardly known. A PubMed search identified relevant trials and meta-analyses from 1970 to 2013. This review summarizes the results of international studies and the current discussion of effects of physical activity on the immune system of breast cancer patients. Highlighted are effects of physical activity on the immune system. Seven original articles and 14 reviews included in this review. Two original and the review articles includes other tumor entities besides breast cancer.Evaluated methods such as dose-response relationships for exercise in oncology, hardly exist. Increased immunological anti-cancer activity due to physical activity is probably mediated via an increase in number and cytotoxicity of monocytes and natural killer cells and cytokines. The effector function of the human immune system is reduced with advanced age and by exogenous agents. This appears to be important for the increased incidence of malignant diseases in the elderly. The immunological reaction can be decreased by partially inactivating antigen-specific B and T cells, dendritic cells, macrophages, natural killer (NK) cells and neutrophils. Furthermore, an increased release of cytokines such as interleukins 1 (IL-1), IL-4, IL-6 and IL-10 has been detected., Pro- and anti-inflammatory cytokines are involved in regulating the immune system and play a major role in the inflammatory processes in cancer. Experimental in vivo studies to investigate the interplay of physical movement and parameters of the immune system in cancer demonstrated that physically trained rats and mice have a higher lymphocyte population and an enhanced macrophage function. In a study with rats a significant increase in dendritic cells was detectable in the exercise group compared to the control group., An anti-inflammatory effect of physical activity by reducing IL-6 plasma concentrations has been described in mice. The relative risk reduction of dying from breast cancer through physical activity is estimated between 10% and 50%.,, The Womens' Healthy Eating and Living Studyreported a relative survival advantage of 50% in women who were engaged in the metabolic equivalent of walking for 30 min 6 days a week as well as consuming five or more portions of fruit and vegetables. Similar protective effects on women after primary breast cancer diagnosis have been described by the Nurses' Health Study, the Collaborative Women's Longevity Study and the Life After Cancer Epidemiology study. These studies reported a 30-40% decrease in the risk of overall mortality among breast cancer survivors who performed moderate intensity activity of at least 1 h/week. The results of the success study suggested that a lack of physical activity, overweight and obesity are not only associated with an increased risk of suffering from breast cancer, but are also associated with an increased rate of recurrence and mortality. Whether immunological effects of sport intervention are clinically relevant resulting in an improved prognosis of breast cancer (disease-free + overall survival) can only be suggested and has remained unconfirmed so far. This review gives an overview of recent studies, which have examined immunological effects of physical activity in cancer patients and specifically in women with breast cancer. Immune-modulatory effects of physical activity could occur and could likely be correlated with an improved course of breast cancer. This would further underline the need for validated and individualized sports therapy concepts in primary breast cancer patients. In this review an extensive literature search was conducted. The search terms were: “Cancer and immune and physical training” and “immune system and cancer and sports.” Further studies on the subjects “physical activity and immune and breast cancer prognosis/survival were found on the reference lists of the identified literature.” International original and review articles from 1970 to 2013 were included. The literature search revealed 21 manuscripts including seven original articles and 14 review articles. These publications are further discussed in this paper. Two original and the review-articles include other tumor entities besides breast cancer. 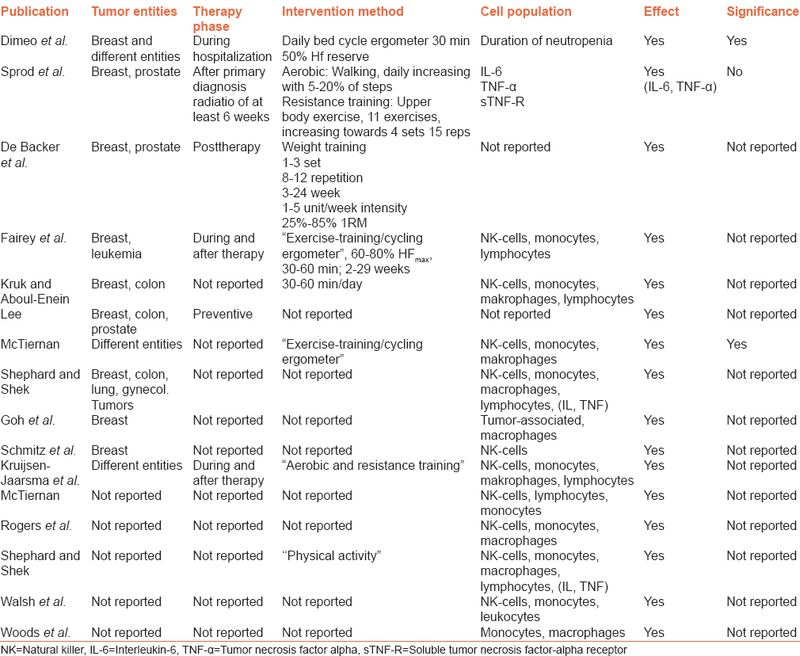 Trial designs described in the original articles and review articles, as well as intervention methods and the effects on immune cell populations are presented [Table 1] and [Table 2]. Regarding the timing of therapeutic exercises in relation to cancer treatment 10 reviews do not present sufficient information.,,,,,,,,, However, Fairey et al. refer to the physical intervention during and after completion of therapy, De Backer et al. describe it after completion of chemotherapy and radiation therapy, Kruijsen-Jaarsma et al. report about an intervention during and after the therapy and Lee focus on primary prevention. Regarding the type of intervention, three reviews present a specific movement description,,, while McTiernan only refer to “endurance training” and Kruijsen-Jaarsma et al. refer to aerobic and resistance training, Shephard and Shek designate “physical activity” as indicating movement. Dimeo et al. report a decreased duration of neutropenia by sports after high-dose-chemotherapy. Patients in the training group performed a daily program of aerobic exercise, consisting of “biking” with a bed ergometer. The patients “bike” for 1 min with an intensity sufficient to reach a heart rate equivalent to at least 50% of cardiac reserve. The procedure was repeated 15 times with pauses of 1 min between bouts. The supervised training was carried out for a total of 30 min each day. The training group has a shorter duration of neutropenia (P - 0.01) and of thrombocytopenia. The requirement for platelet transfusion is also lower in the training group (P - 0.06). The influence of physical activity on sleep-mediating cytokines IL-6, TNF-alpha (TNF-a) and soluble TNF-alpha-receptor (sTNF-R) is described in the study of Sprod et al. In a two-arm study the influence of a home-based-exercise intervention is compared with a standard care on sleep-mediating cytokines. Thirty eight breast and prostate cancer patients were randomized to a 4 weeks exercise program or no exercise arm at the beginning of their radiation therapy. IL-6, TNF-a and sTNF-R were measured before and after intervention. The home-based-exercise intervention consisted of progressive resistance and a walking training. The resistance training portion was designed to be performed at a low moderate intensity, 7 days/week, for 4 weeks. The aim of the resistance training was maintaining upper body muscular strength. The progressive walking component of the home based intervention was designed to be performed at a moderate intensity. The patients wore a pedometer during the initial 1-week assessment period and recorded their daily number of steps. The patients in the exercise arm were instructed to increase the number of steps attained each day by 5-20%. The result from the study support the use of a home-based-walking and resistance training during radiation therapy for breast and prostate cancer to positively influence sleep quality, possibly by regulating mediators of inflammation. The effects of physical activity on the immune system have been examined in a randomized study by Fairey et al. in postmenopausal breast cancer patients who had completed surgery and adjuvant therapy. While the intervention group (n = 25) received an ergometer training for 3 times/week over 15 weeks, the control group (n = 28) had no training. The intensity of the exercise was set on the power output that elicited ventilator equivalent for carbon dioxide. The supervised exercise duration started with 15 min for weeks 1-3. In the following weeks the exercise duration systematically increased by 5 min every 3 weeks thereafter to 35 min for week 12-15. The primary end point of this study was the change of NK cells in peripheral blood. Furthermore, other haematological changes were monitored. The results showed a significant increase of NK cells (P = 0.035) and all lymphocytes (P = 0.007) in the exercise group compared to the control group. Monocytes and neutrophils did not differ significantly. The aim of the study from Hutnick et al. was to determine whether exercise training would increase lymphocyte activation in patients with breast cancer following chemotherapy. In a 6 months exercise – program 3 times a week with a personal trainer 28 breast-cancer patients were compared with 21 patients who did no exercise. The exercise program consisted of resistance training and aerobic activity at 60-75% functional capacity. The primary endpoints was the change in the number of CD4 and CD69 blood lymphocytes, the concentration of interferon gamma and IL-6 in the culture medium of mitogen-stimulated lymphocytes as well as the plasma concentration of IL-6 an IFγ. The exercise patients showed a significantly elevated percentage of CD4 and CD69 cells. Plasma and mitogen stimulated IL-6 and IFγ production were similar in both groups. No influence of physical activity on the immune system is described in the study of Nieman et al. Only 16 breast cancer patients are randomized into the control and intervention group, of which 12 patients completed the study. The focus of the investigation is on physical performance, the cell number of lymphocytes and the activity of NK cells. The 60 min workout of the intervention group consists of a supervised strength and endurance training 3 times a week for 8 weeks. In the aerobic phase, the patients maintained a maximal heart rate about 75% by walking on indoor track for 30 min a session. In the resistance component of the program, subjects completed two sets of 12 repetitions of seven different exercises, with the weight progressively increase throughout the study. As one end point of the study, a significant improvement in the 6 min walking test was detected (P = 0.02) in the intervention group compared to the control group. An increase in cell numbers of lymphocytes and NK cells compared to healthy persons could not be found, while an improvement in physical performance in the intervention group could be observed. The number of T-lymphocytes and the activity of NK cells remains stable. The presented trials and reviews describe physical activity-induced effects on the immune system in terms of cell number changes and cytotoxic activity in breast cancer patients. The studies suggest an improved immunological status of breast cancer patients after physical activity, however the statements of the included studies about the impact of physical activity are different. The different results of the studies may be related to their different designs. The trial reports relate to the phase after surgery and after the completion of radiotherapy and chemotherapy. The designs of the movement therapy trials are partially different and lead to limited comparability of these studies.,,,,,, The intervention programs differ in intensity, duration of each training session, frequency and the total amount of physical activity. While the intensity of the endurance training is specified with a range of 60-86% HRmax by Peters et al., it is at 75% HRmax by Nieman et al. There are also differences in the durations of each training session (30-60 min), in the frequencies (3 times a week/5 days a week) as well as in the total amount (8 weeks to 7 months). Various clinical studies show that physical activity maintains and supports the cellular immune function and has a positive influence on the immune system in terms of tumor development.,,,,,, The intensity and duration of exercise have an important influence on the immune system. A more intense and prolonged exposure leads to an enhanced activation of different parts of the immune system.,,, In contrast, a too hard and too long period of physical exertion can have negative effects on the immune system. Exercise in the middle range of intensities seems to have a stimulating and activating effect. Only few scientific results are available regarding the dosage and appropriate method of exercise intervention. It is still unknown whether endurance training or strength training is more meaningful for immune stimulation. In the included original articles and reviews it is not sufficiently described at which time points blood samples were taken (immediately after training/24 h after exercise or at any other time). The alterations in immune function are short lived and the changes are accumulated over the time and will often depend on the type of exercise and the duration. Once more the identification of the optimal “exercise dose” appears to be crucial. This review discusses literature with a focus on the impact of physical activity on the immune system of breast cancer patients. The quality of studies has improved over time, however optimized concepts and strategies to prevent tumor recurrence and to improve quality of life and survival of cancer patients are necessary. The studies discussed also include other tumor entities than breast cancer. Overall the discussion of these papers is difficult as the performed trials come along with inherent methodological limitations. This also restricts the interpretation of the results discussed. The results of the intervention trials can only show associations. Elements of individual lifestyles could possibly be disruptive. Incidental findings cannot be excluded. In this review we found an increase of the lymphocytes subsets after physical activity in breast cancer patients. Future studies should involve more homogeneous populations. Only a prospective, standardized procedure in controlled clinical studies can provide scientifically more specific statements about effects of a targeted sport intervention after breast cancer diagnosis. For understanding the mechanism linking exercise and immune function in breast cancer patients further research is needed. For physical activity recommendations for breast cancer patients further research is needed. Anzuini F, Battistella A, Izzotti A. Physical activity and cancer prevention: A review of current evidence and biological mechanisms. J Prev Med Hyg 2011 52:174-80. Backer de IC, van Breda E, Vreugdenhil A, Nijziel MR, Kester AD, Schep G. High-intensity strength training improves quality of life in cancer survivors. Acta Oncol 2007;46:1143-51. Carmichael AR, Daley AJ, Rea SJ, Bowden SJ. Physical activity and breast cancer outcome: A brief review of evidence, current practice and future direction. EJSO 2010;36:1139-48. Courneya KS, Mackey JR, McKenzie DC. Exercise for breast cancer survivors: Research evidence and clinical guidelines. Phys Sportsmed. 2002;30:33-42. Dimeo F. Körperliche Aktivität bei Patienten mit neoplastischen Erkrankungen. Dtsch Z Sportmed 2004;55:106-7. Fong DYT, Ho JWC, Hui BPH, Lee AM, Macfarlane DJ, Leung SSK et al. Physical activity for cancer survivors: Meta-analysis of randomised controlled trials. BMJ 2012;344:e70. Horneber M, Fischer I, Dimeo F, Ruffer JU, Weis J. Cancer-related fatigue: Epidemiology, pathogenesis, diagnosis, and treatment. Dtsch Arztebl Int 2012; 109:161-72. Kabat GC, Kim M, Wactawski-Wende J, Lane D, Adams-Campbell LL, Gaudet M et al. Recreational physical activity, anthropometric factors, and risk of ductal carcinoma in situ of the breast in a cohort of postmenopausal women. Cancer Causes Control 2010;21:2173-81. Lucía A, Earnest C, Pérez M. Cancer-related fatigue: Can exercise physiology assist oncologists? Lancet Oncol 2003;4:616-25. Ohira T, Schmitz KH, Ahmed RL, Yee D. Effects of weight training on quality of life in recent breast cancer survivors: The Weight Training for Breast Cancer Survivors (WTBS) study. Cancer 2006;106:2076-83. Schmidt T, Weisser B, Jonat W, Baumann FT et al. Gentle strength training in rehabilitation of breast cancer patients compared to conventional therapy. Anticancer Res 2012; 32:3229-33. Schmitz KH, Courneya KS, Matthews C, Demark-Wahnefried W, Galvao DA, Pinto BM et al. American College of Sports Medicine roundtable on exercise guidelines for cancer survivors. Med Sci Sports Exerc 2010;42:1409-26. Thorsen L, Nilsen TS, Raastad T, Courneya KS, Skovlund E, Fossa SD. A randomized controlled trial on the effectiveness of strength training on clinical and muscle cellular outcomes in patients with prostate cancer during androgen deprivation therapy: Rationale and design. BMC Cancer 2012;12:123. Brolinson PG, Elliott D. Exercise and the immune system. Clin sports Med 2007;26:311-9. Pedersen BK. Influence of physical activity on the cellular immune system: Mechanisms of action. Int J Sports Med 1991;12:23-9. Gleeson M, Walsh NP. The BASES expert statement on exercise, immunity, and infection. J Sports Sci 2012;321-4. Hanson PG, Flaherty DK. Immunological responses to training in conditioned runners. Clin Sci (Lond) 1981;60:225-8. Pedersen BK, Bruunsgaard H. How physical exercise influences the establishment of infections. Sports Med 1995;19:393-400. Senchina DS, Kohut ML. Immunological outcomes of exercise in older adults. Clin Interv Aging 2007;2:3-16. Uhlenbruck G, Order U. Can endurance sports stimulate immune mechanisms against cancer and metastasis? Int J Sports Med 1991;1:63-8. Campell KL, MCTiernan A. Exercise and biomarkers for cancer prevention studies. J Nutr 2007, 137:161-9. Fairey AS, Courneya KS, Field CJ, Mackey JR. Physical exercise and immune system function in cancer survivors: A comprehensive review and future directions. Cancer 2002;94:539-51. McTiernan A. Physical activity after cancer: physiologic outcomes. Cancer Invest 2004;22:68-81. McTiernan A. Mechanisms linking physical activity with cancer. Nat Rev Cancer 2008;8:205-11. Nieman DC, Nehlsen-Cannarella SL, Markoff PA, Balk-Lamberton AJ, Yang H, Chritton DB et al. The effects of moderate exercise training on natural killer cells and acute upper respiratory tract infections. Int J Sports Med 1990;11:467-73. Pedersen BK, Tvede N, Christensen LD, Klarlund K, Kragbak S, Halkjr-Kristensen J. Natural killer cell activity in peripheral blood of highly trained and untrained persons. Int J Sports Med 1989;10:129-31. Walsh NP, Gleeson M, Shephard RJ, Gleeson M, Woods JA, Bishop NC et al. Position statement. Part one: Immune function and exercise. Exerc Immunol Rev 2011;17:6-63. Fairey AS, Courneya KS, Field CJ, Bell GJ, Jones LW, Mackey JR. Randomized controlled trial of exercise and blood immune function in postmenopausal breast cancer survivors. J Appl Physiol 2005;98:1534-40. Shephard RJ, Shek PN. Associations between physical activity and susceptibility to cancer: Possible mechanisms. Sports Med 1998;26:293-315. Loprinzi PD, Cardinal BJ. Erratum to: Self-efficacy mediates the relationship between behavioral processes of change and physical activity in older breast cancer survivors. Breast Cancer 2011;20:47-52. Liao HF, Chiang LM, Yen CC, Chen YY, Zhuang RR, Lai LY et al. Effect of a periodized exercise training and active recovery program on antitumor activity and development of dendritic cells. J Sports Med Phys Fitness 2006;46:307-14. Lima de C, Alves LE, Iagher F, Machado AF, Bonatto SJ, Kuczera D et al. Anaerobic exercise reduces tumor growth, cancer cachexia and increases macrophage and lymphocyte response in Walker 256 tumor-bearing rats. Eur J Appl Physiol 2008;104:957-64. Murphy EA, Davis JM, Barrilleaux TL, McClellan JL, Steiner JL, Carmichael MD et al. Benefits of exercise training on breast cancer progression and inflammation in C3(1)SV40Tag mice. Cytokine 2011;55:274-9. Friedenreich CM, Cust AE. Physical activity and breast cancer risk: impact of timing, type and dose of activity and population subgroup effects. Br J Sports Med 2008;42:636-47. Phipps AI, Chlebowski RT, Prentice R, McTiernan A, Stefanick ML, Wactawski-Wende J et al. Body size, physical activity, and risk of triple-negative and estrogen receptor-positive breast cancer. Cancer Epidemiol Biomarkers Prev 2011;20:454-63. Steindorf K, Schmidt M, Ulrich C. Welche Effekte hat körperliche Bewegung auf das Krebsrisiko und auf den Krankheitsverlauf nach einer Krebsdiagnose? Bundesgesundheitsblatt Gesundheitsforschung Gesundheitsschutz 2012;55:10-6. Pierce JP, Stefanick ML, Flatt SW, Natarajan L, Sternfeld B, Madlensky L, et al. Greater survival after breast cancer in physically active women with high vegetable-fruit intake regardless of obesity. J Clin Oncol. 2007;17:2345-51. Holms M, Chen WDF, Kroenke C, Colditz G. Physical activity and survival after breast cancer diagnosis. JAMA 2005;293:2479-86. Holick CN, Newcomb PA, Trentham-Dietz A, Titus-Ernstoff L, Bersch AJ, Stampfer MJ, et al. Physical activity and survival after diagnosis of invasive breast cancer. Cancer Epidemiol Biomarkers Prev 2008;17:379-86. Sternfeld B, Weltzien E, Quesenberry CP Jr, Castillo AL, Kwan M, Slattery ML, et al. Physical activity and risk of recurrence and mortality in breast cancer survivors: Findings from the LACE study. Cancer Epidemiol Biomarkers Prev 2009;18:87-95. Rack B, Andergassen U, Neugebauer J, Salmen J, Hepp P, Sommer H et al. The German SUCCESS C Study - The First European Lifestyle Study on Breast Cancer. Breast Care 2010;5:395-400. Hutnick NA, Williams NI, Kraemer WJ, Orsega-Smith E, Dixon RH, Bleznak AD et al. Exercise and lymphocyte activation following chemotherapy for breast cancer. Med Sci Sports Exerc 2005;37:1827-35. Nieman DC, Cook VD, Henson DA, Suttles J, Rejeski WJ, Ribisl PM et al. Moderate exercise training and natural killer cell cytotoxic activity in breast cancer patients. Int J Sports Med 1995;16:334-7. Peters C, Lotzerich H, Niemeier B, Schüle K, Uhlenbruck G. Influence of a moderate exercise training on natural killer cytotoxicity and personality traits in cancer patients. Anticancer Res 1994;14:1033-6. Peters C, Lotzerich H, Niemeier B, Schüle K, Uhlenbruck G. Exercise, cancer and the immune response of monocytes. Anticancer Res 1995;15:175-9. Dimeo F, Fetscher S, Lange W, Mertelsmann R, Keul J. Effects of aerobic exercise on the physical performance and incidence of treatment-related complications after high-dose chemotherapy. Blood 1997;90: 3390-4. Sprod LK, Palesh OG, Janelsins MC, Peppone LJ, Heckler CE, Adams MJ, et al. Exercise, sleep quality, and mediators of sleep in breast and prostate cancer patients receiving radiation therapy. Community Oncol 2010;7:463-71. Backer de IC, Schep G, Backx FJ, Vreugdenhil G, Kuipers H. Resistance training in cancer survivors: A systematic review. Int J Sports Med 2009;30:703-12. Kruk J, Aboul-Enein HY. Physical activity in the prevention of cancer. Asian Pac J Cancer Prev 2006;7:11-21. Kruijsen-Jaarsma M, Révész D, Bierings MB, Buffart LM, Takken T. Effects of exercise on immune function in patients with cancer: A systematic review. Exerc Immunol Rev 2013;19:120-43. Lee IM. Exercise and physical health: Cancer and immune function. Res Q Exerc Sport 1995;66:286-91. Goh J, Kirk EA, Lee SX, Ladiges WC. Exercise, physical activity and breast cancer: The role of tumor-associated macrophages. Exerc Immunol Rev 2012;158-76. Schmitz KH, Speck RM. Risks and benefits of physical activity among breast cancer survivors who have completed treatment. Womens Health (Lond Engl) 2010;6:221-38. Rogers CJ, Colbert LH, Greiner JW, Perkins SN, Hursting SD. Physical activity and cancer prevention. Pathways and targets for intervention. Sports Med 2008;38:271-96. Shephard RJ, Shek PN. Cancer, immune function, and physical activity. Can J Appl Physiol 1995;20:1-25. Woods JA, Davis JM. Exercise, monocyte/macrophage function, and cancer. Med Sci Sports Exerc 1994;26:147-56. Rogers CJ, Zaharoff DA, Hance KW, Perkins SN, Hursting SD, Schlom J, et al. Exercise enhances vaccine-induced antigen-specific T cell responses. Vaccine 2008;26:5407-15. Shephard RJ, Shek PN. Potential impact of physical activity and sport on the immune system-a brief review. Br J Sports Med 1994;28:247-55. Woods JA, Davis JM, Kohut ML, Ghaffar A, Mayer EP, Pate, RR. Effects of exercise on the immune response to cancer. Med Sci Sports Exerc 1994;26:1109-15. Lötzerich H, Uhlenbruck G. Sport und Immunologie. In: Weiss, M., H. Rieder editor. Sportmedizinische Forschung, Berlin: Springer-Verlag 1991. p117-43. Mackinnon LT. Future directions in exercise and immunology: Regulation and integration. Int J Sports Med 1998;3:205-11. Shephard RJ, Verde TJ, Thomas SG, Shek P. Physical activity and the immune system. Can J Sport Sci 1991;16:169-85. Shephard RJ. Exercise in the prevention and treatment of cancer. An update. Sports Med 1993;15:258-80. Shephard RJ, Rhind S, Shek PN. Exercise and the immune system. Natural killer cells, interleukins and related responses. Sports Med 1994;18:340-69. Bauer T, Weisser B. Effect of aerobic endurance exercise on immune function in elderly athletes. Praxis 2002;91:153-8. Nieman DC, Henson DA. Role of endurance exercise in immune senescence. Med Sci Sports Exerc 1994;26:172-81. Schuler PB, Leblanc PA, Marzilli TS. Effect of physical activity on the production of specific antibody in response to the 1998-99 influenza virus vaccine in older adults. J Sports Med Phys Fitness 2003;43:404. Hayes SC, Spence RR, Galvao DA, Newton RU. Australian Association for Exercise and Sport Science position stand: Optimising cancer outcomes through exercise. J Sci Med Sport 2009;12:428-34.